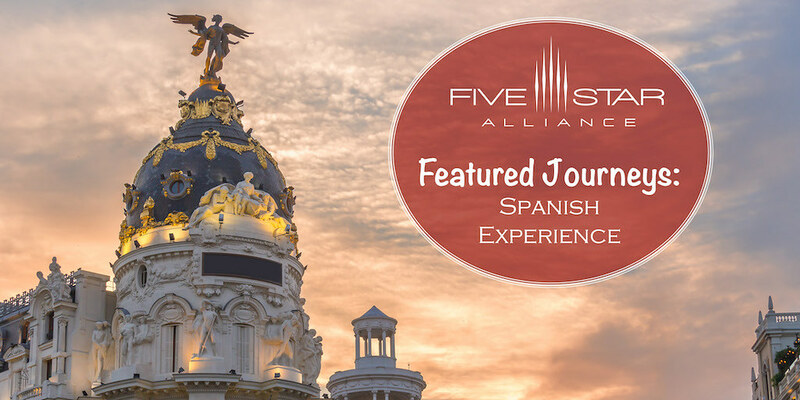 Our newest Featured Journeys highlights three of Spain's top destinations: Malaga, Madrid, and Barcelona. From Mediterranean breezes to bodegas buzzing with locals and tourists, Spain offers adventures for culinary and enthusiasts, as well as one-of-a-kind nightlife options. Learn more about top luxury hotels in these Spanish cities below. Set along Spain's "Gold Coast", Malaga is an Andalusian destination for Mediterranean sunlight, beaches, buzzing tapas bars, and palm-lined promenades. Picasso's original hometown offers art enthusiasts the Picasso Museum. Nestled in a 16th century palace, the museum showcases Picasso's late 1970s paintings. The city's Renaissance cathedral is an ornate masterpiece, and the Moorish Alcazaba are two of the city's iconic architectural highlights. La Malagueta beach and the coves at El Palo are the must-visit spots for sunshine. The Paseo del Parque promenade is an ideal place to meander and cool down under the shade of palms, and La Concepcion Botanical Gardens is brimming with tropical flowers. Dining in this region is all about tapas. Malaga is home to 1,001 tascas (tapas bars), and these bars are an ideal spot to mingle with the outgoing locals while having fresh anchovies, Serrano ham, and calamari. Pedralejo and La Caleta are popular destinations for beach cafes, fried fish, and cocktails at sunset. While the Old Town is a nightlife destination with live music bars, clubs, and bodegas. About 50 minutes southwest of Malaga in Marbella, Puente Romano Beach Resort & Spa offers a traditional Andalusian retreat along the "Golden Coast". From Afternoon Tea on the terrace to a round of golf or relaxing poolside, the luxurious property provides a relaxing setting for travelers looking to soak in the sun and local culture. There's 14 different restaurants on-site, an open-air courtyard ideal for cocktails, spa & wellness facilities, tennis courts, and botanical gardens. Five Star Alliance Perk: Guests booking the "5 Star Signature Package" rate or "Best Available Rate" will receive full breakfast for each guest daily at Alhambra Restaurant and a $100 USD resort credit per room/per stay. Modern Madrid is a diverse destination where cobbled lanes and historic chapels meet contemporary boulevards lined with skyscrapers. Locals and tourists alike can revel in the centuries-old sport of bullfighting at the city's largest bullring--Plaza de Toros, or browse the Prado's extensive collection of art from around the world as well as Spanish masters like Goya and Velazquez, and every Wednesday and Saturday, the Changing of the Guard happens at the Royal Palace. Madrid offers an eclectic food scene along Ventura de la Vega, Plaza de Santa Ana, and the Plaza de Santa Barbara where Madrilenos begin the evening at tapas bars serving manchego cheese, stuffed peppers, chorizo, and Spanish wine, then dine on dinners highlighting Spanish flavors like Valencian paella, Andalusian gapacho, and the Cocido--Madrid's own lamb and vegetable stew. For shopping, Rastro has been the destination for locals and bargain hunters for 500 years. While the Gran Via is the city's trendy shopping neighborhood with Art Deco shops selling the latest styles including handbags made from Spanish leather. To get a panoramic view of the city, Faro de Moncloa is a former transmission tower that has been reimagined into an observation deck 92 meters above the city. Looking for a night on the town? Madrid's biggest clubs are set along Calle Arenal, while the bars of Chucca and Huertas are popular after Midnight. Inspired by the paintings of Velazquez, Gran Melia Palacio de los Duques is located in the heart of Madrid. Nestled within a 19th century palace, the hotel has a historic garden, and guest rooms and suites are infused with touches on the Velazquez masterpiece, Las Meninas. Situated in the former palace stables, the Michelin-starred Restaurant Dos Cielos Madrid by Hermanos Torres with a locally-inspired menu and exclusive location. There's also a seasonal rooftop pool and Thai Room Wellness Center. Five Star Alliance Perk: Guests booking the "5 Star Signature Package" rate will also receive buffet breakfast for each guest daily in Coroa Gallery Lounge & Gardens, a 40 Euro food and beverage credit per room/per stay (excludes Dos Cielos Restaurant), and a welcome amenity. Offering a cosmopolitan destination on the Mediterranean Sea, Barcelona is a vibrant city with Gothic and Modernist architecture. Effortlessly cool, the city is known for the turrets of Sagrada Familia, La Boqueria Market's Iberian ham, olives, and goat cheese, El Born's clubs where partiers dance 'til dawn, and hidden courtyards. La Sagrada Familia cathedral is one of the city's top destinations. Gaudi's masterpiece is full of symbolism. Started in 1882, the church has iconic turrets, stone carvings, and grand facades. The tree-lined La Rambla is ideal for a walk to the maze-like alleyways in Barri Gotic that lead to Santa Maria del Mar Church, and Montjuic's gardens are an ideal spot for those seeking some shade. At the Picasso Museum, visitors can see some of the artist's finest works from early sketches to Blue Period works. For beaches and no-frills fish restaurants, Barcelonta is the place to go. Barri Gotic serves up Catalan fare including Los Caracoles (the snails), salted cod salad known as esqueixada, and pan tomaquet (tomato bread). For Michelin-starred restaurants that put the city on the gastro map, Eixample and El Born offers a variety of gastronomic experiences. In the evening, head to the jazz clubs and tapas bars of Placa Real. Seeking some retail therapy? Passieg de Gracia is known for designer lables, El Corte Ingles is one of Barcelona's top department stores, and boutiques in Barri Gotic, El Born, and El Raval sell unique finds and art. Situated on Sant Felip Neri Square, the Neri Hotel is a Relais & Chateaux property in the heart of the city's Gothic Quarter. Next to the church where Gaudi prayed daily, the boutique hotel has the Neri Restaurant with a creative Mediterranean menu as well as outdoor seating on San Felip Neri Square. For a unique outdoor setting, the Roba Estesa has a rooftop setting for casual cuisine and cocktails overlooking the Gothic Quarter. Five Star Alliance Perk: Guest booking the "5 Star Signature Package" rate will also receive full breakfast for each guest daily, private transfer from the airport, and a welcome bottle of Spanish olive oil.